We Aussies have always had our priorities straight. In country towns across this wide brown land, one of the oldest buildings will almost certainly be the pub. As I said – priorities. In many places the pub will have been preceded only by the railway (thereby enabling us to get to the pub in the first place) and the bank (providing us with funds to buy the next round). And who doesn’t love a good country watering hole? Once the sacred preserve of the sun-scorched, working-class man, today’s pub must appeal to a much broader range of punters in order to survive. Generally there’ll be good quality tucker (quite posh nosh in the case of the trendy gastro-pub), possibly boutique or craft beers, family events, live entertainment and let’s not forget good old-fashioned hospitality. What’s not to love? 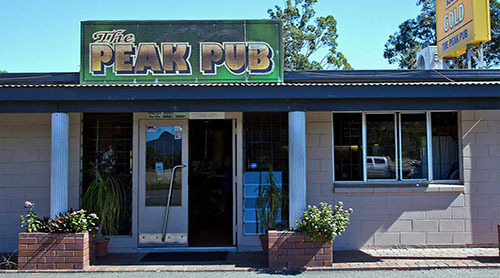 So I wasn’t about to pass up the opportunity to join a country pub crawl through the incredibly picturesque Scenic Rim and Lockyer Valley regions west of Brisbane – let alone a country pub crawl by helicopter. Excuse me? Yep, you read that right. The day involves paying a flying visit (literally) to five country pubs with Ipswich-based Pterodactyl Helicopters. A pint at each pub and a delicious lunch are included, but it should be noted here that this is not an opportunity to get merry at 5,000 feet. Safety is paramount and there’s a limit of one beer per venue. It’s more about the experience. Pterodactyl Helicopter’s affable owner/operator Captain Mike Jarvis is your pilot, guide and chaperone. I have to say up front this is a rock star way to travel. Coming in to land at each pub is one thing, but it’s the taking off that provides the biggest thrill. And invariably there’ll be quite a crowd assembled to see you off. It does the old ego a world of good. In wine there is wisdom; in beer there is freedom; in water there is bacteria. At the bar I chat with an ageing Hell’s Angel with long grey hair and beard and a mean leather jacket. Both he and the jacket look like they’ve really lived. He’s keen to share his views on Queensland’s new anti-bikie laws having staged a number of personal protests – not least of which involved a jousting stick and his Harley during the recent visit of Will and Kate. Apparently the police were not amused. 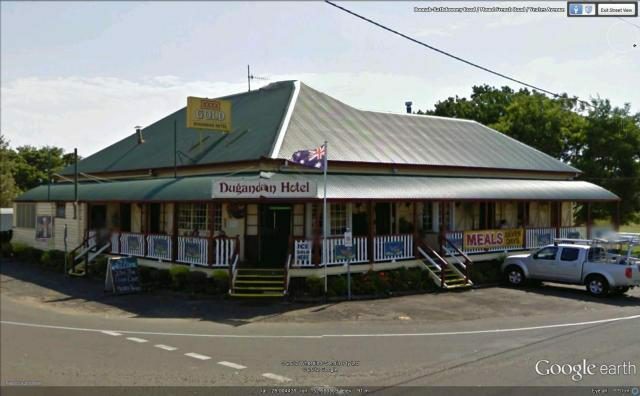 I bid my new friend farewell and we take to the skies for the spectacular flight to our next stop – the Dugandan Hotel in Boonah. The ‘Dugie’ was built in the 1880’s. 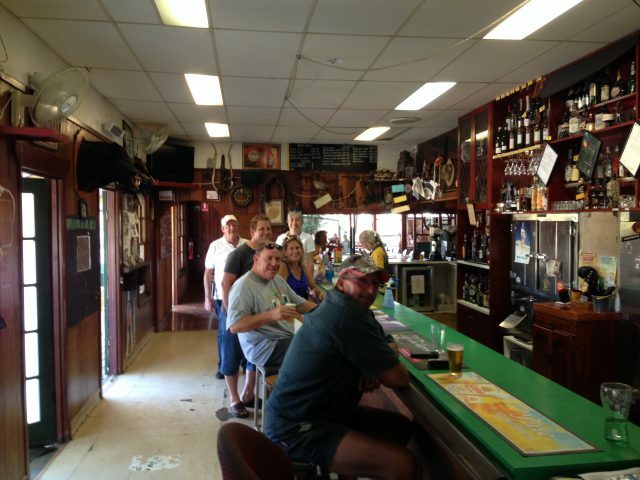 It’s the quintessential county pub compete with VJ walls, corrugated iron roof and a wrap-around covered verandah. Inside you’ll find a fascinating collection of memorabilia covering the early pioneering history of the region. You could literally spend hours here. The pub was built by the Stumers. Look for the photo of Ma Stumer in her rocking chair on the verandah looking every inch the hotel matriarch. 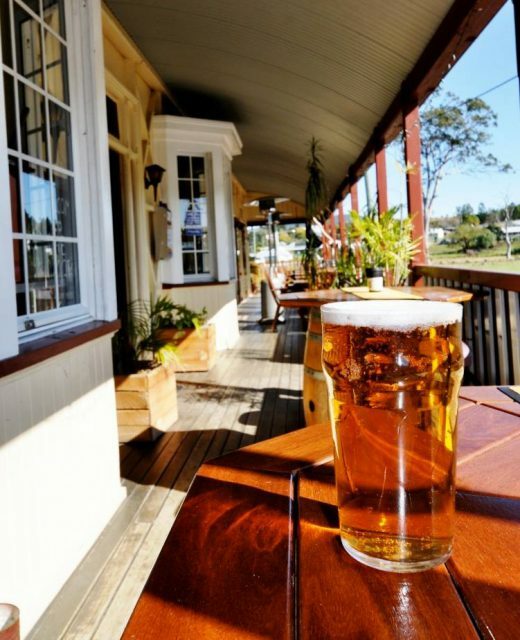 Fast-forward a century, and the pub has recently been acquired by the Sirromet Wines group. I hope it doesn’t go all generic and lose its unique charm. One of the locals has wandered in for a nosey, attracted by our cameras. Over a beer at the bar he tells me about his one and only foray into the performing arts – a high school production of Macbeth, playing one of the wise men. Maybe it was a Christmas adaptation. I let it slide – he’s great company. 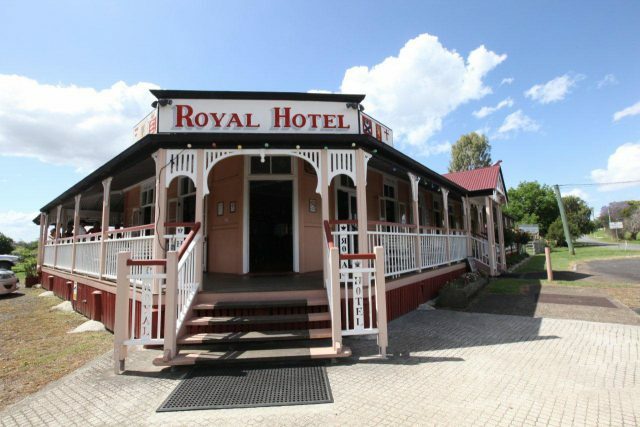 The Royal Hotel in Harrisville, another turn-of-the-last-century country gem, is our lunch stop and the day’s punters have all turned out on the verandah, charged glasses in hand, to watch the chopper arriving in the back paddock. Here we enjoy an amazing pub lunch with a choice of chicken parma, steak sandwich, rib-eye steak and more. I go the steak sandwich and it’s sensational. 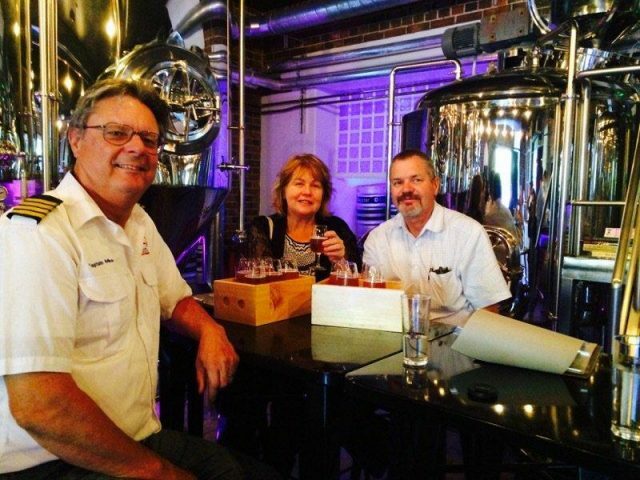 Publicans Steve and Monika are absolutely charming to boot. I never want to leave. Captain Mike rounds me up and everyone heads back outside to see us off. As the chopper lifts off and soars above the pub, circling overhead a couple of times, I’m just amazed by this experience. It’s quite extraordinary. I can only please one person a day. Today is not your day (tomorrow doesn’t look good either). 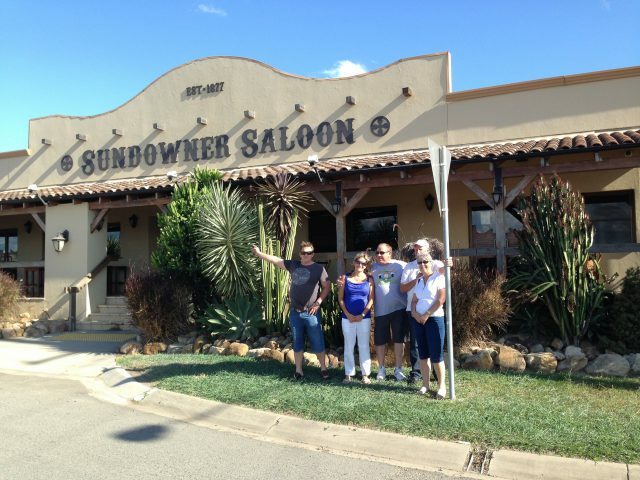 Our last stop of the day is the Sundowner Saloon in Marburg – a mock Wild West affair, complete with a garden of giant cacti and a rather incongruous giant Bundy Rum bottle parked next door. I wonder if any over-indulgent punter has ever done a double-take at the bottle and ended up in the cactus patch. Nasty. What the Sundowner lacks in authentic colonial charm it more than makes up for in hospitality. Publican Mark makes us feel right at home, and all too soon it’s time to re-board the chopper for the short flight back to base in Ipswich. As we take to the skies for the final time and I prepare to return to the land of mere earthbound mortals, I know this is one Aussie touring experience – and a set of uniquely Aussie characters – that I won’t soon forget. Adam Ford hosted this tour on Tour the World.